To people unfamiliar with divination, it may seem that someone who reads Tarot cards is “predicting the future.” However, most Tarot card readers will tell you that the cards offer a guideline, and the reader is simply interpreting the probable outcome based upon the forces presently at work. Anyone can learn to read Tarot cards, but it does take some practice. It’s a highly intuitive process, so while books and charts come in handy, the best way to actually learn what your cards mean is to handle them, hold them, and feel what they are telling you. 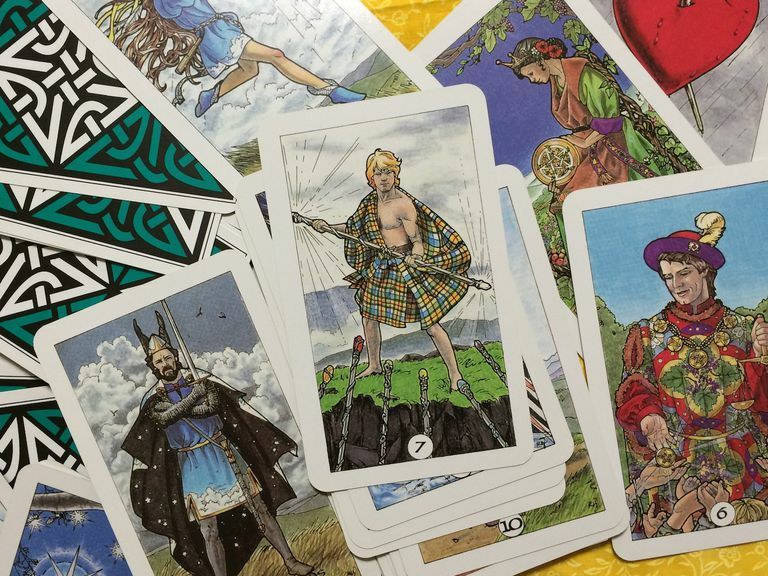 There are hundreds of different Tarot decks available. Some are based upon famous artwork, movies, books, legends, mythology, and even movies. Choose a deck that feels right for you. If you’re not sure which deck is the best one for you, and you’re a beginning Tarot reader, pick up the Rider Waite deck. It is the one used most often as illustration in Tarot instruction books, and it’s a fairly easy system to learn. Later on, you can always add new decks to your collection. A Tarot deck consists of 78 cards. The first 22 cards are the Major Arcana. These cards have symbolic meanings focused on the material world, the intuitive mind, and the realm of change. The remaining 56 cards are the Minor Arcana, and are divided into four groups or suits: Swords, Pentacles (or Coins), Wands and Cups. Each of the four suits focuses on a theme. Sword cards generally indicate conflict or moral issues, while Cups reflect matters of emotion and relationships. Coins focus on the material aspects of life, such as security and finance, while Wands represent things like jobs, ambition, and activity. Any experienced Tarot reader will tell you that reading cards is an intuitive process. Like any other form of divination, the cards become a focal point for your own psychic abilities. There is any number of different spreads, or layouts, which can be used in a Tarot reading. Some readers use elaborate layouts, while others may just pull out three to five cards and see what they need to see. One of the most popular layouts is the Celtic Cross method. Other well-known spreads include the Tree of Life layout, the Romany spread, and the Pentagram Spread. You can also do a simple spread, in which three to five or even seven cards are laid out for interpretation. Sometimes, a card comes up backwards or upside down. Some Tarot readers interpret these reversed cards in a way that is the opposite of the card’s right-side-up meaning. Other readers may not bother with a reversed interpretation, feeling that the messages may be incomplete. The choice is yours. Although you may pull half a dozen cards for someone that indicate all kinds of gloom, doom, and destruction is headed their way, try to keep things positive. If you believe some sort of illness is coming, or their marriage is in trouble, DON’T say, “Holy cow, this is bad! !” Instead, remind them that things can change at any time, based upon the decisions they choose to make in life. Read for anyone and everyone who will let you – and don’t be afraid to tell people what you see. Eventually, you’ll get comfortable with reading Tarot cards, and that’s when your skill will really shine.